In this article, we shall focus on the strategic meaning of the rapid integration of artificial intelligence (AI) by the Chinese military, at the level of command and management of warfare operations. In the first article of this series, we saw how the Chinese People’s Liberation Army (PLA) is working to integrate AI to numerous weapons systems thus developing its “AI (fire) power”. This process is part of the Chinese national effort to become the world leader in the AI field before 2030, through the civil military fusion process (Jean-Michel Valantin, “Militarizing Artificial Intelligence – China (1)“, The Red Team Analysis Society, April 23, 2018). The Government and the Central military Commission of the PLA see AI as a massive force, rapidity and precision enhancer and multiplier of its military apparatus (“Testimony before the U.S.-China Economic and Security Review Commission: Chinese Advances in Unmanned Systems and the Military Applications of Artificial Intelligence—the PLA’s Trajectory towards Unmanned, “Intelligentized” Warfare”, The Long Term Strategy Group, February 23, 2017. In this article, we shall focus on the “intelligentization” process carried out by the PLA, which aims also at reinforcing the cognitive and decision-making capabilities of the command levels through the extremely strong and rapid capability for information treatment of AI (Lt Col Ashutosh Verma, “How China is moving towards intelligentized warfare“, Geospatial World, April 26, 2018). These new capabilities could have massive consequences for the way the PLA conceives warfare operations, especially through the strategic use of AI in order to greatly reduce the uncertainty factor in warfare operation, and thus attain military dominance. As a matter of fact, this militarization of AI may lead to “AI military dominance”, that is to say the military component of what Hélène Lavoix qualifies as “AI power” (“When Artificial Intelligence will Power Geopolitics – Presenting AI” and in “Artificial Intelligence and Deep Learning – The New AI-World in the Making”, The Red (Team) Analysis Society, March 26, 2018). From there it comes that the PLA is experimenting in the way AI could help command levels to lift what Clausewitz calls the “great uncertainty”, i.e. the difficulty to understand the immensely complex object that are warfare operations and thus to take the right decisions at the right moment (On War, Chapter 3, “The Genius For War). First, we shall look at the way the militarization of AI leads from “AI (fire) power) to “AI command decision-making”. Then, we shall see how this AI military trend aims at reducing uncertainty in war. Then, we shall propose a possible outcome for this trend, i.e an “AI dominance” of the future in order to reach military dominance during ongoing warfare operations. Access for non-members or for your package is limited. To continue reading, become a member of The Red (Team) Analysis Society. If you are already a member, please login (don’t forget to refresh the page). Today, contemporary military operations led by great powers take also place in the cyberspace, and may develop at such speed that human operators must now rely on new capabilities to pierce the “clouds of uncertainty”. In this process, it appears that through the intelligentization process of the PLA, the militarization of AI is rapidly becoming of strategic importance in the 21st century, (Helene Lavoix, “Artificial Intelligence – Forces, Drivers and Stakes” The Red (Team) Analysis Society, 26 March 2018). About the author: Jean-Michel Valantin (PhD Paris) leads the Environment and Geopolitics Department of The Red (Team) Analysis Society. He is specialised in strategic studies and defence sociology with a focus on environmental geostrategy. 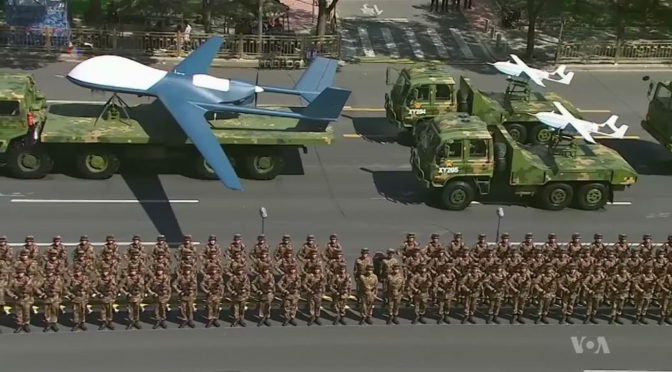 Featured image: 2015 China WWII Parade (screenshot) – 3 September 2015 – From VOA – Public Domain.